Outlast left me a nervous wreck. I rarely make it to the end of first-person horror games, but I was reviewing Red Barrels grisly asylum adventure, and thus had no choice. It’s brilliant and also not very nice. So I’m not sure if I’m going to be powering through the sequel. Red Barrels confirmed that it’s being worked on right now, set in the same universe as the original, but in a different place with different characters. That’s about all Morin was willing to spill, other than the studio’s desire to make a game that even they are almost too scared to play. Even the protagonists ability – or inability – to defend his or herself hasn’t been decided yet. 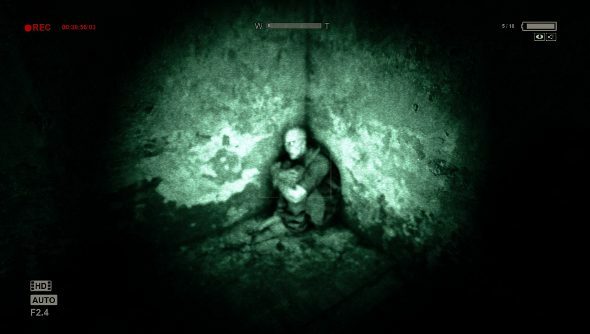 In the original Outlast, escaping threats required a lot of running and hiding, there were no weapons – just a camcorder. I spent a lot of time in cupboards and under beds. Not that those are particularly safe places, either.